arteries and conduits branching out centrifugally." At some point in the last decade, the "unreal cities" of Modernity became post–Real. 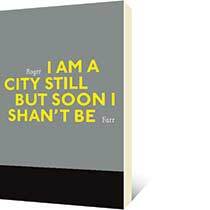 Roger Farr's I Am a City Still But Soon I Shan't Be metabolizes the modernist long poem in order to provide a psychogeographical I–witness account of this transformation. In nine Cantos, or spheres of hell, Farr moves impossibly between major and minor cities, crossing and re–crossing zones, edging boundaries, charting dreamscapes, always drifting, without ever becoming a fl?neur. Vancouver stars in "pre–conceptual" found footage from 1973, which is actually a dream of the future. New York is an "elegant incubator" for the new avant–gardes, who are preparing for another civil war. Berlin is a nightclub, or a mall, that "kettles" its negations. Nanaimo is a necropolis seen through a lens held by the hand of a dead poet. Meanwhile a statue of Artemis explodes from the streets in Siracusa, setting off a riot during the 2010 Olympics. Urban streams, flows of capital, and other bodily fluids run the course of the tour. But there is no outside to Room 514 in the Patricia Hotel. In her review in Canadian Literature of Farr's last book, the Livesay–nominated IKMQ (2012), Melissa Dalgleish observes that "Farr's I is particularly complex." Readers of I Am a City Still But Soon I Shan't Be might come to recognize such lyric complexity as a shared condition of life in the "post–human cities" from which we chart our lines of flight. Described as "a poet of great heart and aesthetic/political commitment", Roger Farr is the author Surplus (2006), Means (2012), and IKMQ (2012), a finalist for the BC Book Prize in Poetry in 2013. His most recent book is I Am a City Still But Soon I Shan't Be (2019). 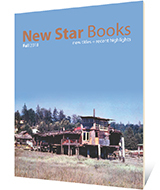 A former member of the artist–run Kootenay School of Writing collective, Roger Farr's critical writing on avant–garde poetics and radical social movements has appeared in Anarchist Studies, Armed Cell, Fifth Estate, Perspectives on Anarchist Theory, The Poetic Front, West Coast Line, and XCP: Cross Cultural Poetics. He edited the three–volume anthology Open Text: Canadian Poetry and Poetics in the 21st Century (2008–2013), and was Critical Editor for Alice Becker–Ho's The Essence of Jargon: Argot & the Language of the Dangerous Classes (2015). Currently he is editing The Amourous Comrade, a collection of writing on anarchist sexual politics by �. Armand. A book of variations based on the writing of 15th century poet Fran�ois Villon is also forthcoming. He is Convener of Creative Writing at Capilano University in Vancouver.